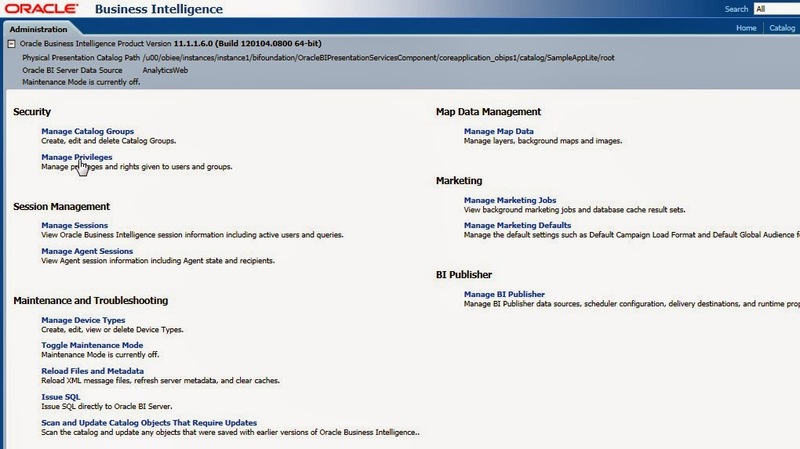 In this short post we will be seeing how to integrate BI Reports with WC. Though there is a very good guide for integrating these two, this post will describe a step which got missed and even after following all the steps BI connection was not working correctly. Following is the link to the PDF which is very useful and practical solution for BI and WC integration. So after creating a successful connection to BI server from Enterprise Manager, Still I was unable to see BI reports when trying to add through composer. So after detail analysis, we found out the the connection was established successfully and there was no problem with it. The problem was that permissions were not given to the user BIImpersonator . Since this user is being used to create connection between WC and BI, it should have all the privileges to the catalogue on the BI Side as well. 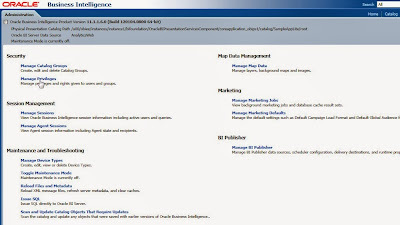 For doing this, login into the BI analytics with Admin user. Go to Admin option at the top right. Scroll and find Catalog.Click on Personal Storage and provide BIAdministrator role to it. Also add BIImpersonator user to BIAdministrator group in WLS. Save and check the connection in Webcenter portal. It works now and you can import all the BI reports from BI server to WC app.